Every fall as Mother Nature’s kaleidoscope transitions to brilliant gold and orange, golfers are reminded, it is time to schedule that winter golf trip. STOP! Don’t robotically sign up for that repetitive men’s club trip to the desert southwest or Florida. Instead, treat yourself to something new and exciting on a tropical Pacific island paradise. Schedule a golf excursion to the Island of Kauai and play Jurassic Park Country Club. At JPCC golfers share the course with descendants of dinosaurs who roamed freely over the perfectly manicured turf. A round of golf at JPCC is a golf experience like none other. I can’t lie: Jurassic Park Country Club does not exist. The descendants of dinosaurs are colorful wild chickens, a variety of exotic birds and small colorful lizards. The Island of Kauai, where Jurassic Park and other Hollywood blockbusters were filmed, is a wonderland filled with tropical treasures. The island contains more golf courses than you can play in a week. As a well- traveled writer/golfer, let me say, “Golf on Kauai has no peer.” Five million years ago lava belched from the ocean floor creating the small island that has become known as the Garden Island. All of the islands in Hawaii’s tropical paradise come with beautiful beaches and mountains. But on this small island, Kauai’s Mount Ha’upu, raising over 5,000 feet above the sea, creates an ecosystem diversity ranging from rain forest to desert. This topographical variety provides a smorgasbord of golf courses comparable to a buffet dinner, featuring only 5-star cuisine. But Princeville Makai Golf Club, on the north end of the island, stands above the rest. The Princeville Makai Golf Club is a fairytale golf course hanging on a cliff overlooking the Pacific Ocean. Managed by Troon Golf, Princeville Makai is the cornerstone of the St. Regis Princeville Resort. Princeville Makai Golf Club is a seaside golfers dream, and lives up to its marketing slogan: Oceanfront beauty. Immaculate Conditions. Unmatched Aloha. Princeville Makai features a host of activities, for golfers and non-golfers alike: incredible golf, a new Championship Mauka Disc Golf Course, a spectacular Sunset Golf Cart Tour – a six stop tour like no other culminating in watching the sunset over the Pacific Ocean, a state-of-the-art four court tennis facility, Sunrise Yoga, and a selection of delicious menu items at The Makai Grill. The course is a perfect blend of Jurassic Park terrain and wonderful golf course design. The Trent Jones, Jr. layout, with a photo op on every hole, was created in 1971. But a renovation, completed in 2009 when Jones, Jr. returned, brought the spectacular property into golf course prominence. Now rated #65 among the best 100 public access golf courses, the Princeville Makai course has few peers. In fact, Travel & Leisure Magazine rates the Princeville Makai course at St. Regis Princeville Resort the best golf resort in Hawaii. The renovation featured the introduction of Seashore Paspalum turf grass on the fairways and green and reshaping of the bunkers. Paspalum provides absolutely perfect seaside playing conditions. Every golfer who experiences the Princeville Makai course remarks, “The greens are the finest seaside greens I have ever played. No grain!” It sounds like a contradiction, but the lush fairways play firm and fast. Unlike most seaside courses, the ball sits-up on the Paspalum fairways at Princeville Makai. The bunkers, that beautifully frame each hole, are filled with firm granular sand imported from Vietnam. “Perfect,” describes the playing conditions. Among the 18 incredible holes sprinkled into the Jurassic Park setting, the third hole provides players with a vision for what lies ahead. The short-iron downhill par-3 plays over a small man-made lake. Normally the lake would create the visual focus, but with Hanalie Bay in the background and dense tropical jungle on the hillside left, golfers must deal with three visual demons. (Hanalie Bay was made famous by the Peter, Paul and Mary song, “Puff The Magic Dragon.” More references to the Jurassic Park Country Club.) The uphill 4th, takes golfers back to the plateau above the Pacific, plays much longer than the scorecard illustrates. The second shot on the par-4, 6th has a surreal feeling. With nothing but blue sky in the background, the long slender green seems to be suspended from puppet strings in the clouds. On the green, the exploding waves, shooting salty spray 100 feet into the Queen’s Bath (a natural seaside pool where sun lovers play) below, create a dilemma; golfers are torn between photography and golf. The signature hole at Princeville Makai is without question the par-3, 7th. The hole is exactly what you would expect from a golf course in this Jurassic Park tropical paradise. 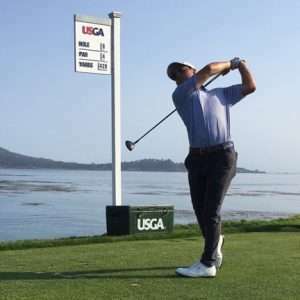 With the 6th hole still a vivid memory, golfers now face a tee shot like no other. The dramatic drop from the right side of the tee to the ocean below creates a sense of vertigo. Once golfers have regained their balance, they are faced with a tee shot from hell. The shortish par-4, 15th is another Jones, Jr. masterpiece. Take-as-big-a- bite as-you-dare is the calling card on this over the cliff dogleg right. A brave tee shot gives players a real birdie opportunity. As golfers putt out, they fully expect a raptor to appear from the dense tropical jungle to the right. The last two holes at Princeville Makai lack the Jurassic Park feel, but will definitely keep the golfers attention. These holes have a man-made “TPC Sawgrass” like feel with water that must be avoided on both. A big tee shot will give golfers a chance to reach the water guarded 18th in two. 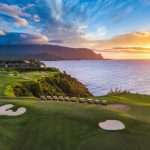 Princeville Makai contains hints of Pebble Beach and Bandon Dunes, but the bold elevation accentuates the dramatic views plus the trade winds are warm year around. In this writer’s opinion: Play the golf course the first time to enjoy the scenery. Then settle into enjoying golf on a really good golf course. It is a golf course that can be tamed. Princeville Makai is the home of an annual collegiate tournament where scores in the mid 60s are not unusual. As you plan your annual winter golf excursion forget about the extra cost of getting to Kauai. Spend some of those Wall Street profits and treat yourself to Jurassic Park paradise. Will Tiger Match Jack Nicklaus’ Record Of 18 Majors?